#1 is not looking for trouble necessarily, but may engage targets of opportunity. If you're just one dude, getting some distance between you and return fire seems desirable. #2 requires the attackers to get in and out fast, and maximizing damage and casualties as quickly. Think of ambushing a convoy or raiding some supply cache. This was true a century ago, and frankly I don't see the fundamentals changing a whole lot even with aerial drones and all the fancy tech today. The conclusion I draw from this, is that the .30 cal battle rifle is suboptimal for either above. In a way its a compromise between precision bolt and fighting carbine. For the raid, I want light and fast. A physically light weight load out, but also something with fast repeat shots. For the scout/sniper, you may only squeeze off a few rounds total, so accuracy and reliability of hits is more important. One of the primary reasons 7.62 is called upon over 5.56 is anti-material impact (destroying machines, penetrating through bariers, etc). The 7.62X51 is significantly better at stopping vehicles and will in fact penetrate through a car impacting those seeking cover on the other side. 5.56 will typically pentrate into an auto but not through it. See here where single rounds of 7.62X51 will penetrate 1/2 inch steel plate while 556 requires multiple hits in same place: https://www.youtube.com/watch?v=KJFhIiomoKw. So in defending a position there is a real advantage to 7.62x51. So in defending a position there is a real advantage to 7.62x51. Hopefully, because that’s the best rifle/cartridge combo I can legally get my hands on. Penetration was the reason for the ICSR (in addition to out distancing). "The Army has identified a potential gap in the capability of ground forces and infantry to penetrate body armor using existing ammunition,” the solicitation reads. The program’s ultimate objective “is to acquire and field a 7.62mm ICSR that will increase soldier lethality." The call for a new 7.62mm rifle emerged from a requirement direct by Vice Chief of Staff Gen. Daniel Allyn in April, Military.com reported. The new rifle must be chambered in 7.62x51mm, not the standard 5.56x45mm used by the Army and that Congress has been pushing the Marine Corps to adopt. The ICSR program comes after Army Gen. Mark Milley, Army Chief of Staff, admitted to Congress that the Army’s M855A1 Enhanced Performance Round cannot penetrate armor plates that may be used by future enemies. The Army also continues to be concerned about overmatch (the out-ranging of soldiers on the battlefield by enemy small arms — a problem discovered in Afghanistan) and the need to penetrate increasingly prolific cheap ballistic body armor. I used to read a lot about real experiences by people who lived in countries that had an economic collapse or natural disaster. One thing I noticed is how rare a real without rule of law (WROL) situation is. Really the only time this happens is if your in a civil war. In most cases your talking 3-5 days without law enforcment or you are talking about a corrupt or overwhelmed police force. I worked in New Orleans after Hurricane Katrina and I can tell you for a fact that it took over an hour for police to respond when someone drew a gun on one of our workcrews. But here is the thing, they did eventually show up. If you snipe someone at 500 yards you are never going to be able to claim self defense in court. If you show up in court after using an evil looking AR15 for self defense your chances of winning just went down by at least 25%. So my first choice would be an old worn out looking Remington 870 pump shotgun. It is still leathal and effective up to 100 yards with slugs. If you go to court you can say you used grandads old shotgun when you were in fear for your life. If you use a $1500 dollar AR with a $1000 scope loaded with $5/ea zombie killer bullets the prosecution will say your a vigilante who was looking for trouble. That said I still own 2 ARs. Cheap ammo, low recoil, fun to shoot, and good accuracy. It is the ideal compitetion gun and if we ever have a civil war (looking more likely) then your ready. If I have to bug out on foot I'm taking a Marlin Papouse take-down 22 with a few 20 round mags and about 400 rounds of CCI Mini-Mag ammo and 100 rounds of sub-balistic ammo. It's tough. Bear in mind that if all we cared about was penetration .50 BMG and .338 Lapua would rule the day. If we looked at capacity .22 short would be king. Here's a very real question... If you were in a firefight relatively close would you rather a WWII bolt or a 10/22? We only need look at WWII to learn that actual combat favors volume over accuracy. This is the proving ground of the Thompson, grease gun, Sten, and Sturmgewehr. The aftermath saw the development of the AK by a Russian tank operator who wanted something at hand that was small yet capable. I will advocate that there is no better balance of power and volume than the AR. But it's hard to be all things in all places. I can imagine a dense forest where a .44 magnum "mare's leg" is a great gun. The 30-30 levers shine there too. Contrast that with open tundra and you soon find that the Finnish make some of the longest and biggest caliber guns in history. Cracking this nut is not easy. If I was told I had to lead a force on force mission with lots of unknowns the AR is ideal. If I'm out on a scout mission maybe not. And I'm out hiking in the wilderness in peacetime frankly there are better options. I'm going long but I want to add one more point. We very much misunderstand snipers because of movies. Even the legends of WWII didn't shoot very far. The ammo, rifles, and optics all kinda sucked compared to today. And modern snipers use weapons and choose locations where they know the dope or offer a view with intel options. We would never make the mistake of putting Vasily Zaytsev and Chris Kyle in the same group (I hope). Vastly different roles. If you snipe someone at 500 yards you are never going to be able to claim self defense in court. If you show up in court after using an evil looking AR15 for self defense your chances of winning just went down by at least 25%. More likely than a WROL situation is having to deal with a rifle bearing attacker. Classic example is the University of Texas Tower Shooter. Perps take high ground with rifle and only way to take them out is with a direct rifle hit from you or the laying down of suppressive fire so others can get close enough to storm the position. Officer Houston McCoy, 26, heard of the shooting on his radio. As he looked for a way into the tower, a student offered to help, saying he had a rifle at home. McCoy drove the student to his home to retrieve the rifle. Officers attempting to reach the tower were forced to move slowly and take cover often, but a small group of officers including Houston McCoy began making their way to the tower via underground maintenance tunnels. Officers and several civilians provided suppressive fire from the ground with small weapons and hunting rifles, forcing Whitman to stay low and fire through storm drains at the foot of the observation deck's wall. A police sharpshooter in a small plane was driven back by Whitman's return fire but continued to circle at a distance, seeking to distract Whitman and further limit his freedom to choose targets. It works the other way too, where the good guys take the high ground with rifles and are able to repel large numbers of bad guys. 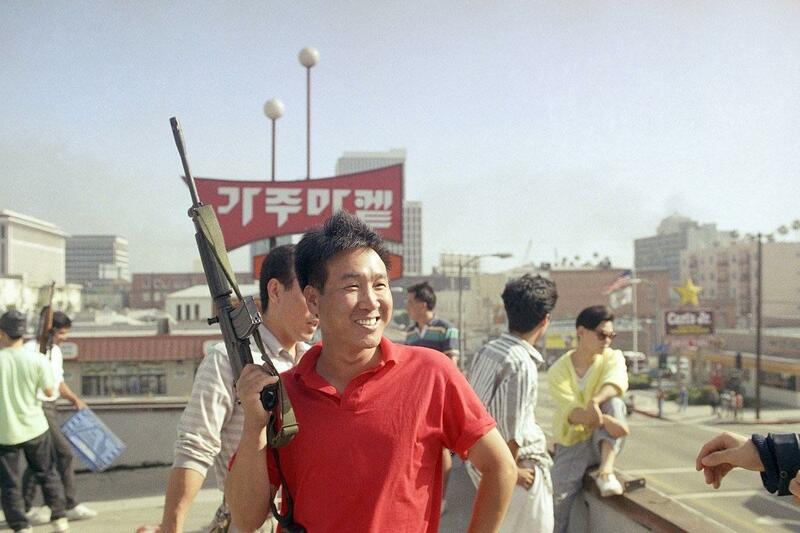 Example would be the defense of K-town during the LA riots. The use of rifles saved their homes and businesses. Awakened by the noise of a group of men kicking in his apartment door early Sunday morning, Derrick G. Murray rushed to retrieve the assault rifle he keeps in his bedroom for protection. Only seconds later, he pulled the trigger, shooting one of the intruders in the leg and sending all of them fleeing from the residence they had just invaded. Speaking Sunday afternoon on the front steps of the South Side house where it happened, Murray said his thoughts at that moment turned to his four children and how inaction might mean missing out on their futures. "I just felt like 'I can't die right now,'" Murray said. "I got too many kids, I got too much to lose. I can't die right now." Evansville Police Department detective Sgt. Larry Nelson said Murray acted well within his rights in firing on Clark. "He had a right to protect himself," Nelson said, adding no permit was necessary for Murray to keep the gun in his home. It happened about 5 a.m. when Murray was the only one in the apartment, which sits on the southwest corner of Riverside and Elliott Street. The children — who range in age from 2 to 7 — happened to be gone, visiting Mississippi with their mother, Murray said. Had the children been home, Murray said he would have responded to the intruders with even greater force. "It would have been a death sentence," he said. "You don't do that to a man when he's with his kids at all. It would have been much uglier. That gun held 60 rounds and I would have shot all 60 at them." "I'm still breathing," he said. "I feel good. And I can see my kids when they pull up in a couple hours." Yes, and it can also be helpful to a lot of new preppers to see the different angles of the decision. After reading probably a hundred threads like this on various forums a few archetypes have emerged. Basically there is relationship between people's prepping philosophy/goals and their firearm choices. The below is a summary. To me all of these archetypes are positive role models so I hope no-one takes my descriptions in a negative vein. Mountain Man Mike. To Mike the goal of prepping is to become self-sufficient. His time and effort are devoted to living a life of freedom from others in his cabin. He sees a rifle as a means to this end, primarily helping him put meat on the table to augment what he raises. But like all technology he employs, he desires to be able to maintain it on his own. His 45 caliber muzzleloading rifle serves this purpose well being able to harvest all types of game by varying the powder charge; squirrel, rabbit, turkey, deer. Nearby pockets of flint and galena provide him ignition and ball. And he has learned to make powder from chicken droppings. He has also developed both wood and metal working skills so is confident in making any needed repairs himself. City Sue. Sue loves the convenience of the city, especially not having to spend money or time taking care of a car, house, or property. But she also knows the city has a dark side; people who will do her harm for profit, pleasure, or both. To her mind this includes the possibility of full scale riots where all rule of law is lost. The rifle serves two jobs for her, defending the apartment and keeping her safe should she need to meet up with her friends to bug out on foot. The rifle and its ammunition needs to be lightweight so she can carry it. She isn't concerned about making shots past 100 yards but is concerned about getting in an extended engagement with multiple adversaries and running out of ammo. To her the compactness, magazine capacity, and relative lightness of ammo makes semi-auto carbines like the M4 style AR 15, AK 47, and vz 58 ideal choices. Rancher Rick. Rick like many homesteaders sees his rifle as nothing more than an important tool. As such he needs it to be "handy" - that is easy to have on hand when he goes about his property and easy to use when a job needs to be done. Typically this means protecting his livestock and crops from predators and pests. His pistol caliber lever action rifle has just the power and range he needs. It has proven reliable and robust and as an added bonus uses the same reloading components as the revolvers he keeps in his truck and at the home. Bunker Bob and Betty. To Bob and Betty the motto "be prepared" means having the resources stored away to survive any storm, should that be a natural or a man-made one. Even a 'Red Dawn' military invasion is on their list of possibilities to prep against. Needless to say, they take the physical security of their 'bug-in bungalow' seriously and to them a rifle is a means to reach out and touch intruders before they are able to touch them. Towards this end they have mapped the distance from the home to notable landmarks out to 600 yards in every direction. This way they know precisely the sight adjustments needed on their battle rifles to hit any target within this range. While they looked at the M1 Garand, FN FAL, HK G3, and several others they settled on matching M1As as a fine blend of reliability, accuracy, power, and capacity for controlling the 'rifleman's quarter mile'. Suburban Sarah and Sam. To Sarah and her husband Sam a rifle is a means of recreation. Once every couple of months they go on a 'plinking date' at their local range and once a year they go to her parents' property to deer stand hunt. But they also realize that problems aren't always isolated to the city and that a rifle can be an added asset to their pistol in defending their cul-de-sac in a time of trouble. They prefer to use the limited "gun time" they have for fun pursuits and view reloading and home gunsmithing as chores they rather not add to their list. So they appreciate major manufacturer warrantied firearm models in calibers stocked at the local Walmart. They are also concerned about what their neighbors think and especially don't want to be labeled 'gun nuts'. They looked at a variety of bolt and semi-auto rifles before choosing a scoped Ruger Mini-30 with ten round mags. It is 'enough gun' for deer hunting and they can plink with cheap ammo but it also gives them options in a SHTF scenario. My neighborhood is surrounded by high ground with a single paved entrance in front and a dirt fire road in back with long straight line visibilities. Probably only need a pair of defensive positions to cover the neighborhood and roadblocks (gangbanger lowriders in front, white trash 4x4s in back) with M1As. I don’t see myself raiding, ambushing, or assaulting anyone else’s position so mobility and firepower deficiencies don’t count against my scenario as much. I'm kinda similar in that I'm almost at the end of a 300 yard road that dead ends into a park with a pond. Maybe part of the bias. Also maybe good advice for young homebuyers. Buy the high ground cul-de-sac. Even in a worst case WROL we're pretty easily guarded by a handful. Beyond location there are other concerns. Will you be walking? Skiing? Horseback? Motorcycle? Is it -25? Here's one we all forget... Are you competing? Competition has really changed our gun market. From long slide Glocks to 1911 "space guns" the competitive market has had a lot of influence. And that is one area where the AR is king. But it's also a funny influence because when I race at the gun club it's my Kimber 1911 vs. (the other better than me pistol shooter) a CZ-75 that has a ton of work. And neither of us put those guns on our hip when we leave. There's lots of bias here. But I think it's worth considering what is practical for me. Maybe it's multiple. Maybe it changes seasonally. I have many (maybe 7) axes. 2 machetes. Maybe I'm a little off looking to optimize one gun when I have a shed full of shovels. And thinking tools I don't have a "compromise hammer". And thinking about what Freelancer wrote my street might be optimally defended with a flaming Uhaul. Any extra layer of defense that could save a bunch of shooting is a good thing. After a little more reflection, the entrances to my development could so easily be turned into uphill murder funnels it's almost like they excavated it out of the badlands with that in mind. I just ran some elevation sight lines on Google Earth to double check the pair of defensive positions I envisioned and came up with an unobstructed 300 degree 400 to 10 yard field of fire in front, and 360 degree 800+ to point blank, out back. This back position could reach the 450 yards, well above the homes, across to the ridge line on the opposite side of the development. I'm on flat land but the burbs here were built with long swooping curves and fingers jutting off of them (if that makes sense). I am in a dead end off a ring that dead ends. In the summer passing between the "fingers" is hard because of fences and hedges and in the winter snow it's downright impossible. I couldn't go out my back door if I wanted to. So in the event of civil unrest we'd be pointing hunting rifles down the street. It's one thing if you live on a standard city block. But out here our roads are controlled by the river (Mississippi) and lakes and things like that. My uncle is on top of a big hill in CA and jokes that his civil unrest plan is a big rolling log. Spartacus style. All jokes aside if you live in a non-traditional layout there likely is some opportunity to make use of the land and roads. We also like that "there is no reason to come down our road". All this plays a part in my gun bias. I'll confess I know that few neighbors have access to a shotgun. Somebody would have to be pretty dumb to cause trouble down a dead-end where there are a few armed retirees and a stay at home dad. And I like the shotgun for that. But come a need for neighborhood defense we could put a picnic table in the cul-de-sac and basically bench rest a couple deer rifles. All worth thinking about when choosing a rifle. My grandfather was big on real estate. He used to flip distressed properties in south Los Angeles in the '70s and early '80s. He always advised living on a hill if possible. They survived the Watts and Rodney King riots both. Not that either were in very close proximity, but there's anecdotal evidence that rioters and looters are on the lazy side. I guess the 500ft hill climb is an added barrier. Yeah, I don’t know about the rest of the world, but out here the gangbangers do travel on foot sometimes, but not far from the hood, and even less after the pavement ends. They really don’t like being in the ‘wilderness” and get spooked easily in that environment. White trash don’t mind the “wilderness” so long as they can drive through it, but they don’t walk any further than they can throw an empty beer can.